My 3 year old son LOVES story time and as a result of this we have amassed quite the collection of books - as with anything, some are always more popular with him than others and he has a collection of firm favourites which we read again and again - I recently shared his current favourite books but personally I find that certain books suit certain times of the day better. 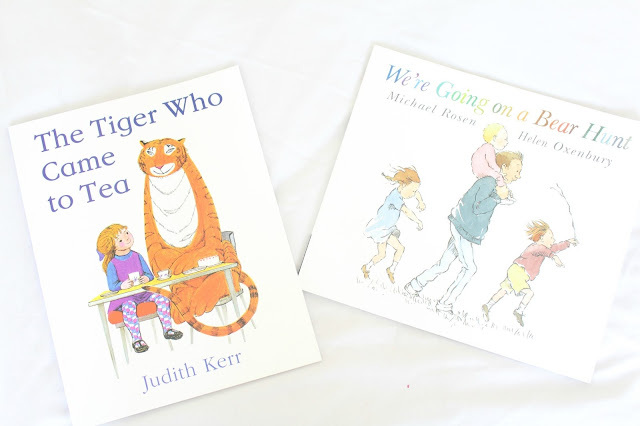 A lot of the books my little one loves are quite exciting ones or ones that require a bit of interaction, and these usually get him quite hyped up - which is lovely to see, but perhaps not the best books for bed time! However we have settled on a firm few favourite bedtime stories which, due to their rhythm and flow are absolutely perfect for calming him down and getting him in a nice, settled mood ready for a good nights sleep. 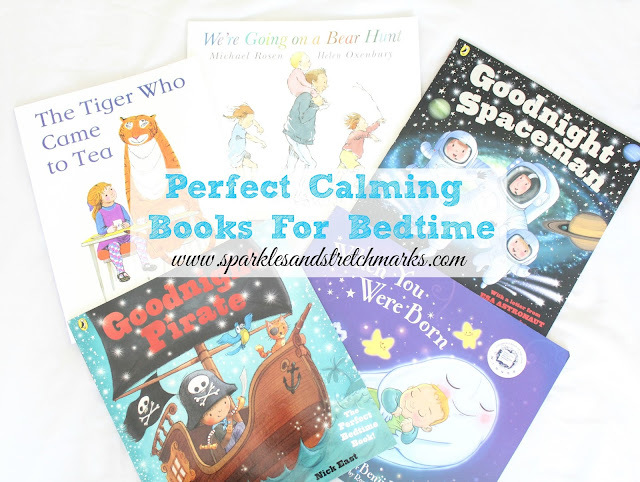 Today I'm sharing those perfect bedtime books with you! This is a real classic childrens book and no doubt one that most of us will recognise from our own childhoods - I wasn't sure whether it would stand the test of time as its one of those stories where not a great deal really happens but I was pleased to see that its magic still works even all these years later. My son was absolutely entranced by the story, and sat listening intently throughout the first time we read it - since then he asks for it often at bedtime and due to its slow pace it is ideal for getting him settled down. There's enough going on in the story to entertain him but it doesn't reach any big excitable peaks which rile him up either - perfect! The repetition in the story is ideal for toddlers as they so enjoy the familiarity and pattern with each page, and it didn't take long at all before Tyne had it committed to memory to read along with me - the illustrations are simple but perfect - Tyne loves to play "Bear Hunt" whenever we go to a woods now and he asks for the story all the time. Goodnight Pirate by Michelle Robinson was a book that I almost didn't buy - I'll be honest, I like a bargain and when I buy books I usually choose ones that cost less than £4 but I knew this book would appeal to Tyne as he's in a real pirate-loving phase at the moment so I took a chance on it. I am SO glad I did as it's fast become his absolute favourite bedtime story - and mine too! The illustrations are lovely and the flow of the simple words are absolutely ideal for bedtime - it is charming, simple and so effective and calming and soothing little ones ready for bed. The first time I read this book it actually brought a tear to my eye as there is something just so magical about it - it's encapsulates everything lovely about childhood play and imagination to me as the narrator bids goodnight to all of the pirate things the little boy has as he settles down to sleep for the evening. I love this story - which is fortunate, because we've read it every single night for the past two weeks and I don't see that changing any time soon! Goodnight Spaceman is another from the lovely "Goodnight" series by Michelle Robinson and I purchased it after hearing astronaut Tim Peake read it during Cbeebies Story time special. The book includes a letter from Tim Peake which is very sweet, and a lovely addition to it but the story itself is what I love - again, like the Goodnight Pirate book, there's something magical about it and the illustrations are lovely. This following two brothers who's Daddy works on the space station as they imagine themselves as astronauts, bidding farewell to space and all of the planets - it is simple, sweet and perfect for bedtime with it's calming rhythm. And finally, When You Were Born by Benji Bennett. I'll admit, this is quite a strange story in some ways - it's very unlike anything else we have but I just adore the concept that a baby gets to choose his or her parents when they're born, and the illustrations of the various "fluffs" to choose from was ever so sweet. Tyne doesn't read a great deal into the story but he loves it nonetheless, it's colourful illustrations really draw him in and it really does make a lovely bedtime story. I hope you find some recommendations to try out from our favourites, and we'd LOVE to hear what your little ones favourite bedtime stories are as we are looking for new books to try out!! We love the tiger who came to tea and were going on a bear hunt. I'll have to check out the other books as we are big readers and Blake loves books.